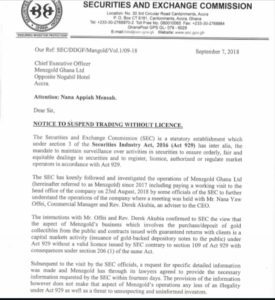 The Securities and Exchange Commission (SEC) has written to gold-trading firm, Menzgold Ghana Company, to stop forthwith, all investment trading in gold without licence. 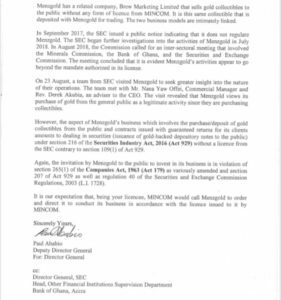 In the 3 September 2018 letter signed by Deputy Director General, Paul Ababio, the SEC said: “In September 2017, the SEC issued a public notice indicating that it does not regulate Menzgold. 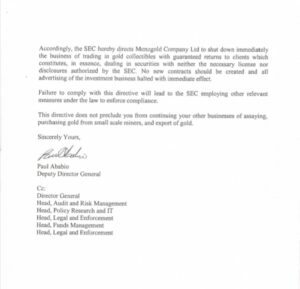 The SEC began further investigations into the activities of Menzgold in July 2018. 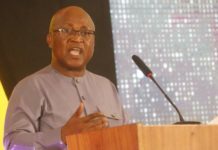 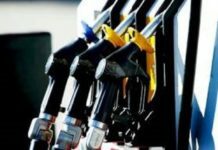 In August 2018, the Commission called for an inter-sectoral meeting that involved the Minerals Commission, Bank of Ghana and the Securities and Exchange Commission. 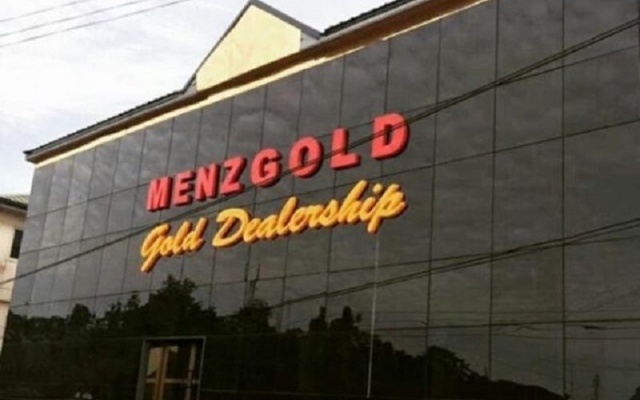 The Meeting concluded that it is evident Menzgold’s activities appear to go beyond the mandate authorised in its licence”. 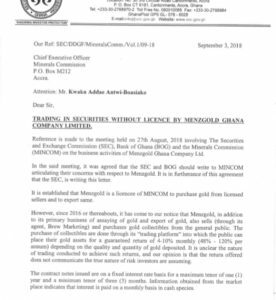 The central bank cautioned the general public that anyone who transacts “any of the above-mentioned businesses with Menzgold Ghana Company Limited does so at his or her own risk,” and the Bank of Ghana will not be liable in the event of loss of investments of deposits. 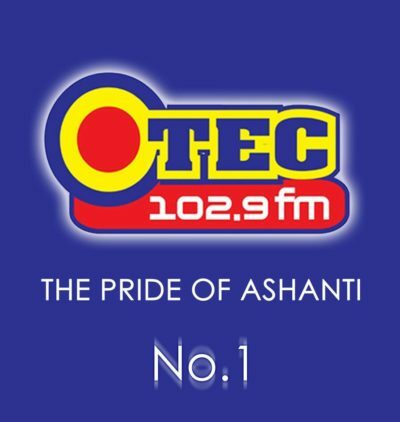 Nana Appiah Mensah, owner of the gold-buying firm, has denied on a number of occasions that his company takes deposits. 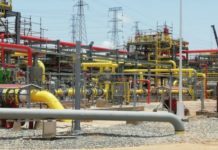 Just last week, 3 September 2018, some clients of the gold-trading firm converged on its premises in fury to demand their “extra values” on their gold investment which they said had delayed unduly, since the payment was being streamlined through the banks, instead of the over-the-counter status quo.